Hey there- it’s Val and the team here in Turks & Caicos with an update on some of the latest and greatest here on our super island. NEW & EXCITING! We have some amazing new villas that your guests would absolutely love to hear about, a new luxury yacht company that just launched, a new restaurant in Grace Bay and so much more. It’s luxury – all the way – with this new yacht charter company that’s now cruising our turquoise waters. 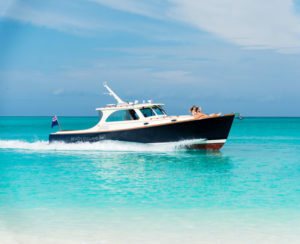 With a fine fleet of vessels, you can’t go wrong with recommending and booking this amazing LUXURY EXPERIENCE when you book your high net worth clients to Turks & Caicos. 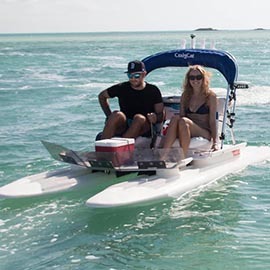 Follow your guide and venture through our many cays, private beaches and waterways – learn a little history of the island while at it – operate your own 2-seater power catamaran that reaches speeds up to 30 MPH. Be sure to ask us about getting a reservation for your clients at Grace Bay’s newest restaurant on the scene – PROVENCE! Chef Eric’s French/Italian heritage comes to life in this new DINING EXPERIENCE that’s truly outstanding. 5 Bedroom Luxury Villa on Grace Bay! A stunningly elegant, newly completed, coral stone villa located on the most enviable stretch of world-renowned Grace Bay Beach – just 5 minutes from the heart of Grace Bay with its restaurants and shopping. Rave reviews are pouring in from our travel advisors’ clients! 3, 4 & 5 Bedroom Options available. Two more locations to be opened soon on Long Bay beach and Grace Bay beach. Two 8 Bedroom Villas and a 7 Bedroom Villa offer privacy and seclusion, these marvelous luxury beachfront homes have unforgettable views of the azure blue Atlantic. In a few weeks, Wymara will add a new villa offering, tucked into an elevated hillside overlooking the bay, includes access to the Resort’s amenities on Grace Bay. Hope you’ve enjoyed this short update from us. Stay tuned for the soon-to-be-opened Shore Club Villas, a new watersports company, Cocovan Restaurant, and so much more. As always, we’re here for you AND your clients (LITERALLY! ), so please feel free to call toll-free, text, skype, whatsapp, live chat with us, or just reply to this email for a quick response. Sending my very best regards from Grace bay.